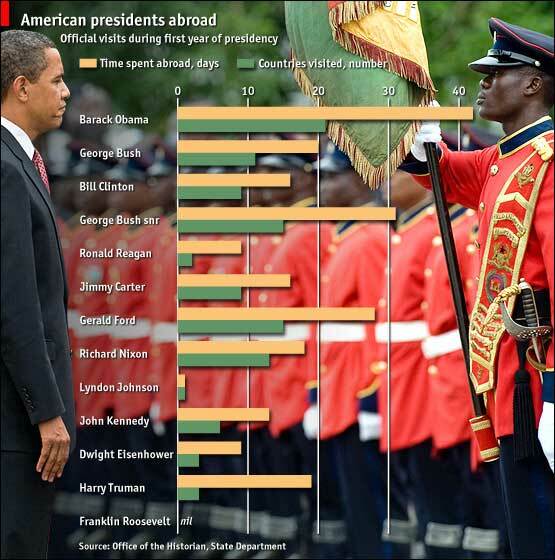 According to The Economist, President Barack Obama has been the “keenest presidential globetrotter” over the course of his first term. It’s interesting to note that over the past year the United States has also been experiencing it’s worst economic challenges since the Great Depression. The President at that time, Franklin Delano Roosevelt, traveled only to Canada and that was for a vacation. Of course, travel today is much easier and quicker than it was back then. Additionally, an argument can be made that there was a real need to repair the United States’ image abroad. Tagged with President Barack Obama, travel.